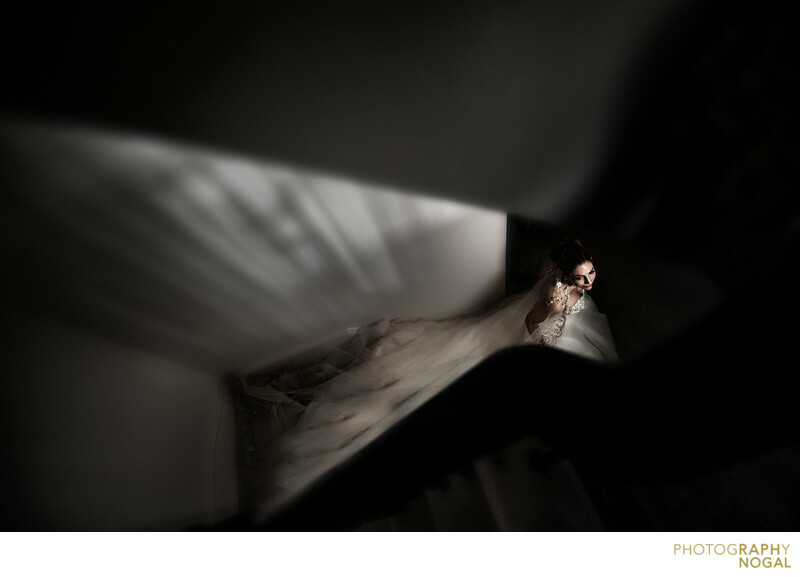 Taken at the bride’s home, this fashion-inspired photo shows the bride descending the stairs after getting ready for her wedding day. Hard, dramatic lighting and off-camera flash were used to emphasize shadows and highlights, resulting in a stylized photograph. The deep shadows ensure the focus is on the bride and her dress, while also giving the shoulder straps and train details more attention. This photo was taken with a Nikon D700 DSLR at ISO 800, f2.8 aperture, 1/400th shutter speed with a Nikon Nikkor 14-24mm f2.8 zoom lens, at 14mm focal length. The lighting was a the Westcott Ice Light, held by Oliver camera left under the stairs. The Ice Light provided a beautiful natural looking light that was streaming in, imitating natural windows light. This image won a Silver Award at Wedding and Portrait Photographers International (WPPI) in the Bride Alone - Wedding Day category.